He was a master in arts magical, but not yet Incantor et Magus. Now Vergil Magus, the powerful sorcerer-poet, returns in the long-awaited prequel to Avram Davidson’s best-selling novel of fable and magic, The Phoenix and the Mirror. Here, Vergil’s extraordinary adventures begin as he journeys into the hideous heart of evil and darkness…. Enter the very rich city of Averno and discover a place of untold riches and untamed lusts, of orgies and drunken revelries, of madness and human corruption. Here is a decaying metropolis of wizards and warlocks, where old crones spin webs of cruelty and deceit, and hell lurks in a labyrinth of underworld caves. Vergil has come to Averno to uncover the secret of its eternal fires, the very center of its wealth and prominence. But as he explores the inner sancta of this ancient and heartless inferno, he finds, too, the fiery bed of Poppaea, the beautiful wife of the city’s most influential Magnates. With this forbidden pleasure comes forbidden knowledge, and Vergil is drawn into a web of intrigue that threatens to turn the terrible power of Averno against him. For centuries, the lords of the city have thrived on the bloody sacrifice of their own people. Now they are determined to add one more name to the scrolls of Averno’s dead...and to cast Vergil, now an outlaw, into the burning pits of the dying empire. ©1973 Avram Davidson (P)2013 Audible, Inc.
Read Avram Davidson, but don't start here. 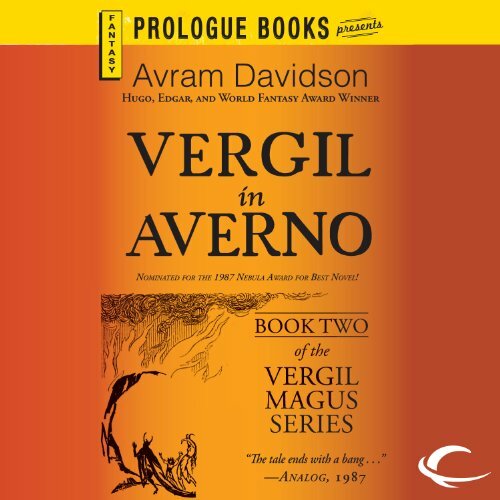 Vergil in Averno is the second book in Avram Davidson’s trilogy about Vergil Magus. It was published in 1986, 20 years after its predecessor The Phoenix and the Mirror which told how Vergil (yes, that Vergil) created a magic mirror for Queen Cornelia. I enjoyed that book for its interesting period details and the appealing humor. You don’t need to read The Phoenix and the Mirror to understand Vergil in Averno. This story can stand alone. In Vergil in Averno, Vergil travels to (surprise!) Averno, a region in Italy where volcanic activity has created a toxic lake and boiling water travels just below the surface of the earth. (Early Romans thought Averno was a gate to Hell and the real historical Vergil mentions it in The Aeneid.) When he arrives Vergil finds that, as rumored, Averno is an evil place. It stinks of the sulfur fumes from the lake and the waste that its citizens throw into the streets. The water is dirty, there are no trees, and the people are barbaric. They proudly give tours of their torture chambers. Vergil mentions them publicly farting, belching, picking their noses, scratching their crotches, picking lice off themselves, and peeing on each other in taverns. How charming. Why would Vergil, a sophisticated and educated man, want to go to Averno? Because it keeps coming up in conversations and in the scrolls Vergil reads. He feels that he’s being called there for some specific purpose, and so he is. This mystery of who has called him and why makes up the plot of the book, if you can call it a plot. It’s really more like a travelogue… a travelogue to the last place on Earth you’d never want to visit. "The boy nodded, nodded… The troops were useful, very useful, the troops kept apart the hordes they met upon the roads. Hordes, hordes, some mere seekers after curiosity." After a while, the repetition grates on the nerves. Much of the word count is made up of Vergil’s little asides, interior monologues, and random ponderings. These are often extremely amusing, even when Vergil is simply debating with himself about what to do for the evening — go to a chatty friend’s house for dinner, stop at a tavern, visit a prostitute, or read a book (and which book). The random digressions are actually the best parts of the “story,” but they don’t contribute to an overarching plot. There are also bizarre dreams and visions which, again, take us out of the main plot which have something to do with Vergil constructing maps and histories of Averno and meeting its strange denizens. I listened to the audio version of Vergil in Averno which was narrated by Robert Bluemenfeld. I rarely have trouble staying focused on an audiobook, but I admit to zoning out a few times toward the end of Vergil in Averno. This was not the fault of Mr. Blumenfeld. He did a great job with what he had. If you haven’t read any of Avram Davidson’s work, I recommend that you do, but please don’t start here. Read his short stories and The Phoenix and the Mirror first.